It’s been a grueling 7 year wait, but it’s finally over. Tamashii Nations has at last delivered on a promise to revitalize the Garo line of S.H. Figuarts. Kicking things off with a brand new take on the iconic Golden Knight, the greatest Makai Knight is reborn as S.H. Figuarts Shinkocchou Seihou Garo! Garo has been lavishly recreated to the most minute detail for the first time in the franchise’s 13 year history. The Golden Knight is recreated in near perfect 1/12 scale form, replete with chrome golden armor, armed with the mighty Garoken and it’s scabbard, this figure is the perfect starting point for a new Garo collection. With this figure out now, and his ally the Fanged Knight Zero due in November, could this finally be the Renaissance of Garo for S.H. Figuarts? I certainly hope so! We’ve attached the full 90 image gallery to this post, but you can also read up on our extensive review of the figure by clicking “Discuss on the TokuNation Forums” at the bottom of this post. This figure has been a long time in the making, and we took this opportunity to document as many of it’s details as possible. We hope you enjoy this extensive gallery, we’ll be back soon with more from Kamen Rider Build & Kamen Rider W! Following their two-part release of the original series and KIBA spin-off due in February, Kraken Releasing have announced that their next GARO release will be the franchise’s first theatrical film – GARO: Red Requiem. The film is also notable for introducing Rekka, a Makai Priest who has become a staple member of the cast ever since. GARO: Red Requiem will be released on April 10th 2018 with a retail price of $19.98. 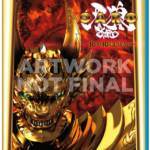 Ready to add another piece of GARO to your blu-ray collection? Sound off in the discussion!